In the West's public schools, corporations and conservationists quietly compete to control what students will learn in the largely unregulated field of environmental education. How green is this Tree? Some critics say that Project Learning Tree, one of the most popular environmental education programs, is too biased toward the timber industry which helps to underwrite it. 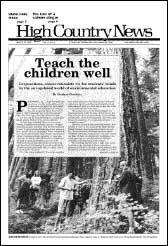 Jeff Mitchell in Philomath, Ore., and Clinton Kennedy in McCall, Idaho, are two teachers who have found creative ways to teach environmental studies in the conservative West. A list gives some of the resources environmental educators can find on the Internet. Conservation organizations and activists are suddenly feeling lost and lonely in Washington, D.C., in the new, anti-environmental world of George W. Bush and friends. On a tributary of Oregon's Nehalem River, the writer worked with Fish and Wildlife biologist Michele Long to scatter the carcasses of hatchery salmon, which feed a wide range of wildlife. Geoffrey O'Gara's book, "What You See in Clear Water," explores past and present on Wyoming's Wind River Reservation, and describes the continual conflict over control of the Wind River watershed. An Idaho State Land Board report called "Breaking the Gridlock" recommends ways for locals to work with the federal government to manage public lands. "Voices from the Woods: Lives and Experiences of Non-timber Forest Workers," an oral history compiled by the Jefferson Center, documents the lives of Northwestern mushroom harvesters, tree planters, herb gatherers and others. Deer vs. trampoline; wild turkey vs. mailman; Wilderness Society vs. Gale Norton's parents; hints for contacting legislators; cheesy art comes to Powell, Wyo. ; Utah Legislature vs. hate-crimes bill. The Ides of March; spring visitors; report from a land-use management seminar sponsored by FREE (Foundation for Research on Economics & the Environment). Griles nominated deputy Interior Sec'y; Mont. Gov. Judy Martz wants state to get 5,000 federal acres; pumice mining in San Francisco Peaks, AZ, ends; Sen. Craig Thomas' bill would repeal Yellowstone's snowmobile ban; N.M. keeps cockfighting legal. Gayla Benefield of Libby, Mont., is among many fighting to keep the Montana Environmental Policy Act intact in the face of Republican attempts to weaken the far-reaching and powerful law. A new law means that Idaho farmworkers will be entitled to receive a minimum wage for their labors. Stimson Lumber Company says the Alaska National Interest Lands Conservation Act entitles it to build at least 21 miles of new road through endangered species habitat in the Selkirk Range of Idaho and Washington. The Army Corps of Engineers has been ordered to come up with a plan to lower salmon-endangering high temperatures and gas content in the Snake River. Some Moab, Utah, residents are fighting a luxury resort and development called Cloudrock that developers want to build on a state-owned mesa south of town. A special April 1 front page of HCN ponders the time warp happening in Washington, D.C., and the West, worries about feral computers and the House Disposable Resources Committee, and celebrates cow-intensive artwork.